Leading Manufacturer of din 20022- 1sn (excees sae r1) single wire braid hoses, din 20022- 2sn (excees sae r2) double wire braid hose, din 20023- 4sh four spiral tempered wire hoses, arrow hydraulic hose, arrow line hydraulic hose and arrowline rock drill wire braided hose from Ahmedabad. Reinforcement : 1 high tensile steel wire braid. Cover: Synthetic Rubber Weather, Oil and abrasion resistant. Application : High Pressure Hydraulic Oils, Air and water. Reinforcement : 2 high tensile steel wire braid. Application : Extra High Pressure Extra Heavy duty Hydraulic Oils, Air and water. 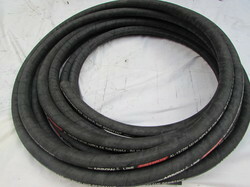 Const - Tube: Seamless Synthetic rubber, Reinforcement : 4 Spiral of High tensile Tempered Wire Braids. 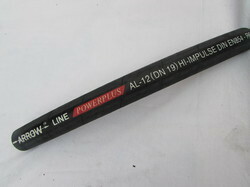 We are offering Arrow Hydraulic Hose. 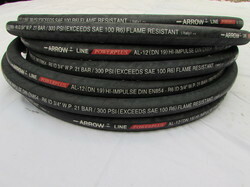 We are offering Arrow Line Hydraulic Hose. By keeping track with the market development, we are engaged in manufacturing, wholesaling, trading and supplying an optimum quality Arrowline Rockdrill Wire Braided Hose. 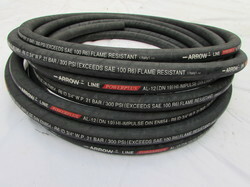 We provide this wire braided hose by testing it properly on quality provisions. Our wire braided hose is designed as per the set quality standards by our professionals using optimum quality synthetic rubber. 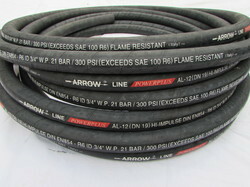 Customers can avail this wire braided hose from us at nominal rates. 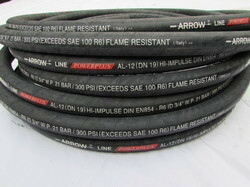 Single Wire Hoses offered feature superior construction standards and provide for flexible connection support in hydraulic systems. Further, these hoses are available with single wire braid finish as well as rubber cover support so as to offer optimum functional support. Some of its features include hoses developed from oil resistant synthetic rubber lining, abrasion resistant rubber cover, suitable for use to transfer steam at high temperatures, resistant to high temperatures and others. Our extensive domain expertise assist us in designing and developing a wide range of steam hose. These steam hose are suitable to use in industry to transfer steam at high temperature. 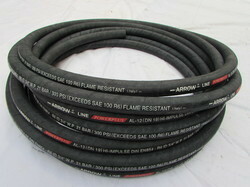 Furthermore, Single Wire Braid Steam Hose range is made from qualitative rubber, which is resistant to high temperature.